I am so thankful to Sonya, a friend and commenter, for sharing a gluten-free tortilla recipe with me! I didn't follow it exactly, so here follows my modified recipe. 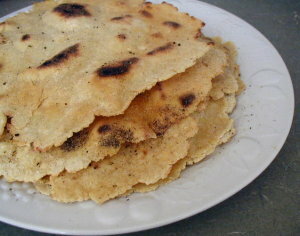 The original is Living Without's Gluten-Free Flour Tortillas. We enjoyed these today as wraps with shredded chicken and shredded goat cheese. We all agreed they were the best tortillas ever! Who needs gluten? These are just as good, if not better! 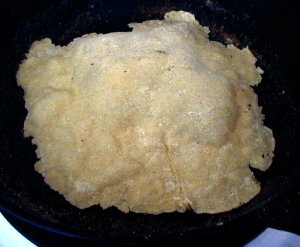 *Flour Tortilla Variation: Increase the brown rice flour to 1 cup. Use 1 cup of buckwheat flour instead of the corn flour. No other changes are necessary. This is a very yummy variation! Combine all the dry ingredients. Whisk to combine. Add the oil and cut it in with a whisk or a fork. Add 1/2 cup water. Mix well. Add more until the dough becomes soft and hangs together when made into a ball. Heat a cast-iron skillet over medium heat. Generously flour a clean counter-top with corn flour, for rolling. Form a 2-inch ball of dough, then flatten it. 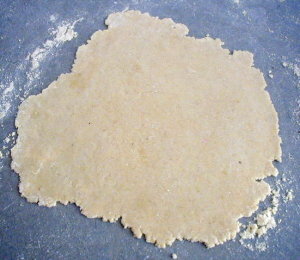 Using natural wax paper (from Natural Value) between the dough and a rolling pin, roll the dough into a 1/8-inch thick circle, about 8 inches in diameter. 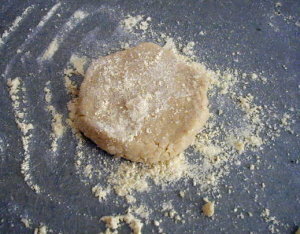 Rotate the dough as you roll to prevent it from sticking to the counter; dust with more flour as necessary. If the tortilla does stick to the counter, release it by sliding a spatula between it and the counter. Transfer the tortilla to the heated cast-iron skillet. Oiling is not necessary if the skillet is well seasoned. Allow to cook on the first side until big and puffy, about 1 minute. The underside with have spots of browning. Flip over and let the second side brown. Transfer cooked tortilla to a dinner plate and cover with a towel to keep soft and warm. Begin the process again with a new tortilla — shaping it and baking it. Once you develop a rythmn, you'll be able to roll one out while another is cooking. Unfortunately, this is one of those foods for which I can't figure out a plastic-free method of storage. So, store them in a zipper-seal plastic bag in the fridge or in the freezer for future use. Sonya, yes, they were nice and pliable! Even on the second day, though I heated them in a dry skillet to make them warm and soft to dip in our thick stew at lunchtime. Last night I made a more dry batch, purposely trying to see if I could get them to roll out more easily, but they ended up more crumbly and more dry. As you can see, I myself have not mastered the perfect tortilla shaping! My edges are jagged, though they are ending up being basically circular (some are better than others). I am able to maintain a consistent thickness. I wonder why you’re not. How are you rolling them out? Have you been able to replace plastic in rolling them out? I have had no trouble using natural wax paper, in fact, because it doesn’t get all wrinkly and stick to itself, I would think it would be easier to use than plastic wrap. Maybe that would make the difference for you. Thanks again for sharing the recipe! I posted here yesterday to let you know that I ordered the back issue of Living Without which has the potato bread recipe. I can’t wait to try it! Just want clarification on the potato flour. I assume, because you seem to be clear and precise that you meant flour, and not starch. Is that right? If so, do you know of an acceptable substitute for the flour? Sorghum? We have possible potato allergies/issues here, so I’m trying to avoid that. Thanks in advance! Yes, it is potato flour, from Bob’s Red Mill. Instead of that I would just use some other flour, like tapioca, sorghum, garbanzo/fava, or even cornstarch or arrowroot powder. This is the lightest flour of the bunch and according to Sonya, who shared the recipe, she likes the tortillas much more with the potato flour than without it. Although I know she made them first without it (subbing gar-fava maybe?). So you’re probably safe no matter what. I hope you give them a try! I keep meaning to ask you….do you use organic corn flour and if so, where do you find it? I have been looking high and low for an organic source to no avail. With the high levels of contamination and GMO factor in corn, I like to use organic. I hope you and yours are enjoying these lovely lingering days of summer. For some strange reason, here in Oregon, every warm sunny (non-rainy) day after Labor Day feels like a bonus day of summer to be enjoyed to the fullest. Yes, I do use organic corn flour. Corn is one of those foods that I’ve determine we will do without if it isn’t organic. I buy it from Azure. That’s the one grain I don’t grind myself because I can’t get it that fine in the Vita-Mix, plus the kernels are so hard that they make a terrible racket when grinding and we literally think we’re under gunfire attack! That’s how we feel too. Today is so beautiful. I’m about to shoo the kids outside as we’ve finished school and lunch. God bless you and your family! Thank you for clarifying that! I feel like a dunce for having mis-read the original recipe! i love you website and all your great recipes and now that I’m over sea i would love to make them since I have much more time. book says to. I never really made any flour before so i need help here. I am assuming that i would have to let the kernels dry but do i put them in the oven or do they air dry? then can i grind them in a regular grinder or i would have to get special one for corn flour? then while I am preparing the trotillas do i have to add another flour to them for the corn flour would be enough? thanks so much for your help cant wait to try another one of your yummy recipes.